The link below takes you to a page that describes the Atkinson Steam Vehicles and their history. The page is part of the County Donegal Railway Restoration Limited site. The site also contains many photographs and reference materials. first published in The Phœnix, Spring 1996. According to the Oxford English Dictionary a Phœnix is a bird "fabled to burn itself on a pyre and rise renewed from the ashes"; (CDR) which makes it a very suitable title for the journal of a society seeking to restore the County Donegal Railway. The title comes, of course, from the name of the diesel tractor, No. 11, of the CDR which itself had risen from the ashes of a supposedly unsuccessful vertical boilered steam locomotive purchased from the Clogher Valley Railway. This locomotive had been constructed by Atkinson-Walker Wagon Ltd of the Frenchwood works, Preston. Atkinson-Walker Wagons Ltd, which was an amalgamation of Atkinson Wagons Ltd (who had absorbed the Leyland Steam Wagon Company of Chorley) and Walker Bros (Wigan) Ltd., produced no more than twenty five locomotives between 1927 and 1931, the majority of which worked on industrial railways in Britain and overseas. Walker Bros. (Wigan) Ltd. was founded in the 1890s as Walker J. Scarisbrick and Bros., the name being changed about 1880, and produced some twenty steam engines until about 1888; diesel passenger railcars being manufactured at a later date. However, the design of the Atkinson-Walker engines is attributed solely to Atkinsons, who were much better known for their road steam vehicles. All of these locomotives had vertical boilers within all-enveloping bodywork, giving them the appearance of boxes on wheels. They were built in four classes with 0-4-0 or 0-6-0 wheel arrangements and end they were all of standard gauge except numbers 111 and 114 (the Clogher Valley engine) both of which were 3ft gauge, and 105-108, which were exported to Singapore. Information on the Atkinson-Walker locomotives is hard to come by and, in some cases, it is even uncertain as to which of the four classes (A-D) they belonged as, unfortunately, all the company's records and drawings were destroyed long ago by their successors, Atkinson Lorries (1933) Ltd.
Patterson states that Atkinson-Walker were in liquidation by the end of 1929, which may be correct, but they had certainly not stopped building locomotives. Perhaps the receiver permitted them to fulfil their orders in order to recoup as much cash as possible. The Clogher Valley engine lay out of use for some time until in December 1931 it was purchased by the County Donegal Railways minus its boiler, cylinders, brakes and lighting  for £125. It was then fitted with a Gardner diesel engine and became no. 11 in the CDR's railcar stock, proudly carrying the name Phœnix. It had a useful life on the CDR despite a lack of speed, pulled demolition trains and survives to this day. Whether the conversion to diesel was actually necessary is very much open to question however. Given that there is no record of any of the other examples of the make proving unsatisfactory in service and that several of them had long and active lives, one must call into question the competence of her crew on the Clogher Valley Railway. Atkinson-Walker locomotives may not have been swifts but neither were they dodos. It is a happy circumstance that Phœnix has survived to run once more on the County Donegal Railway, but waht a pity we shall never see her in steam. * The Redlake Tramway and China Clay Works, E. A. Wade, Twelveheads Press, 1982. British Steam Locomotive Builders, James W. Lowe, Goose and Son, 1975, pp. 31-32. Industrial Locomotives of Central Southern England, Industrial Railway Society, 1981, p. 118. The Redlake Tramway and China Clay Works, E. A. Wade, Twelveheads Press, 1982, pp. 76-80. The Clogher Valley Railway, Edward M. Patterson, David & Charles, 1972, pp. 216-219. The County Donegal Railways, Edward M. Patterson, David & Charles, 2nd ed. 1969, pp. 168-9. 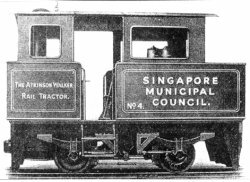 General Specifications of Class A.3 Atkinson-Walker Rail Tractor, author's collection. The Engineer, 13th November, 1925, pp. 513-514. Geared Steam Locomotives, in Modern Traction for Industrial and Agricultural Railways, 1928, pp. 27-28.